I am no fan of the Fair Work Commission’s “determinative conferences”, and have previously posted blogs to that effect. They are not in my view a suitable method of resolving a case before the Commission which involves a dispute concerning the relevant facts because they are a wholly ineffective and entirely unreliable method of testing the credit of witnesses. In the following extract from a decision of the Fair Work Commission by a senior member of the Commission, Deputy President Anderson, whilst deciding that he was prepared to permit a contested matter to be handled as a determinative conference, is at least expressing his comprehension of the delicate issues involved, and expressing his acceptance of the need to be on high alter. Personally, I remain unconvinced of the appropriateness of the procedure when there are contested facts which in my view can only be satisfactorily resolved by a hearing involving the provision of tested evidence in the orthodox legal manner. Sections 397, 398 and 399 of the FW Act are relevant to determining the mode by which I will determine Mr Constable’s application. The FWC must conduct a conference or hold a hearing in relation to a matter arising under this Part if, and to the extent that, the matter involves facts the existence of which is in dispute. (1) This section applies in relation to a matter arising under this Part if the FWC conducts a conference in relation to the matter. (2) Despite subsection 592(3), the FWC must conduct the conference in private. (b) informing itself in relation to the application. (b) informs itself in relation to the application. (b) whether a hearing would be the most effective and efficient way to resolve the matter. (2) If the FWC holds a hearing in relation to a matter arising under this Part, it may decide not to hold the hearing in relation to parts of the matter. Mr Constable says that determination by conference would be more informal, and as a self-represented applicant, more conducive to the effective presentation of his case. Caddy say that the factual differences between the parties require fact-finding which is best undertaken through the witness box in a formal courtroom setting. It says that this would be the most effective and efficient way to deal with the matter. I take into account the statutory scheme which provides that determination by hearing should “not” be held unless the Commission considers it appropriate after taking into account the views of the parties and whether that course “would be the most effective and efficient”. I have heard the views of the parties. I consider there to be no inherent reason why a legal practitioner representing a party needs to do so from the familiarity of a courtroom. The fact that Caddy is to be so represented, with permission, is not a reason for not conducting proceedings by conference. The more substantive issue is whether the nature of these proceedings is more effectively conducted through evidence in conference or evidence in the witness box. Neither option is unworkable. Just how extensive the factual conflicts are remains to be seen, as well as whether their resolution involves matters of credit or recall. 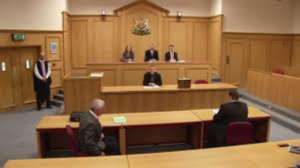 While factual issues in dispute are readily tested through the orthodox setting of a witness box, a properly structured conference still provides for the giving and testing of evidence by examination and cross examination, even though proceedings are conducted more informally. I will list the matter for determination by conference, at least in the first instance. Consistent with the provisions of section 399(3) of the FW Act and the power to inform myself in such manner as I consider fit (section 590(1) FW Act), should I consider it appropriate at any stage of proceedings to proceed by way of hearing rather than conference I will inform the parties, seek their further views and make a further determination.